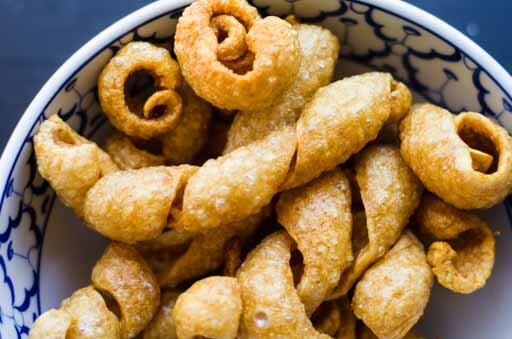 I wanted to make my own pork rinds to experience throwing something into hot oil and have it puff 10 times. On my last visit to my local Hispanic store, the ready to use roll of pork rinds came home with me. And the fun began. 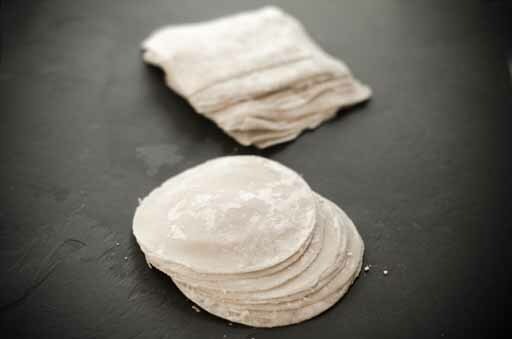 The process of drying and frying the rinds was much easier than I thought. Right after I took the pictures, the bowl of pork rinds disappeared in no time. Please make sure you have plenty of liquid to drink before and while eating the pork rinds to prevent tummy ache and dehydration. You've worked hard, you're so exhausted and can barely decide what to eat. 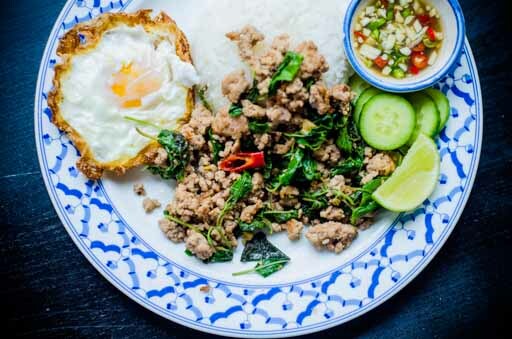 The choice for many Thai's is 'pud grapow', one of the best-tasting and easy to cook dishes. 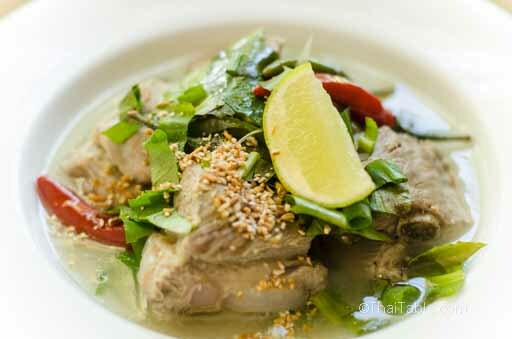 Walk into nearly any restaurant in Thailand and you know the chef can make 'pud gaprow'. And your meal will be decent enough. When you down a pud ga prow you know have the energy for the next challenge. Pud Gaprow comes in many shades and flavors. There are pud gaprow with chicken, pork, beef, and seafood. The latest popular pud gaprow is the thousand-year-old egg pud gaprow. Pud Gaprow is so versatile, so homey, so familiar and so loved. The heat level can hit anywhere from none to very high. The meat, rice and the cucumber make the dish a complete meal with proteins, carbs and veggie. Why isn't Pud Gaprow more famous than "Pad Thai'? 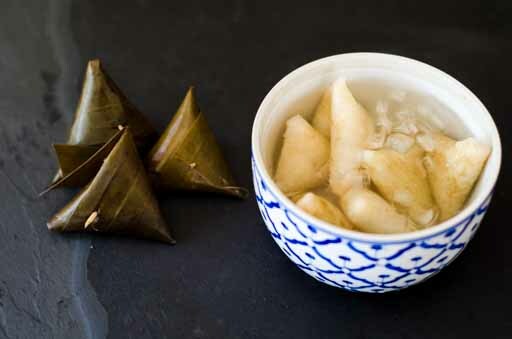 Kow Tom Nam Woon, as it’s known in Thailand, has been a hard-to-find dessert these days. Even its old name ‘Gra Jub’, most Thais never heard of. My guess for the disappearing dessert is that as Thailand moves into the modern economy, any products that take less time and make more money are favored. Even a well-regarded dessert like Kow Tom Nam Woon can become extinct. Kow Tom Nam Woon hits 3 great spots; the chewy texture of the sticky rice, the fragrant sweetness and the cold shaved ice in fiery heat of Thailand. When the air is so thick that you can’t breathe and you’re sweating profusely, having chewy Kow Tom Nam Woon going down to quench your overheated body is like drinking cool nectar from heaven. What sets southern food apart from other regional food in Thailand is the tumeric and the non-stop fiery heat in your mouth, tongue and down in your belly. 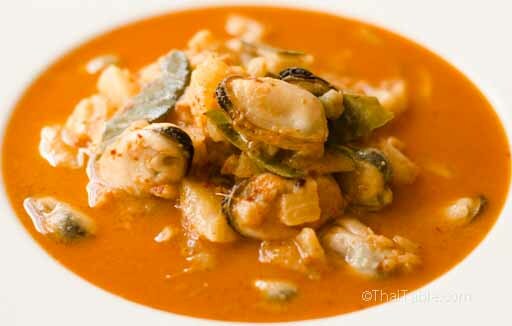 From this curry paste, many other famous southern dishes are formed. 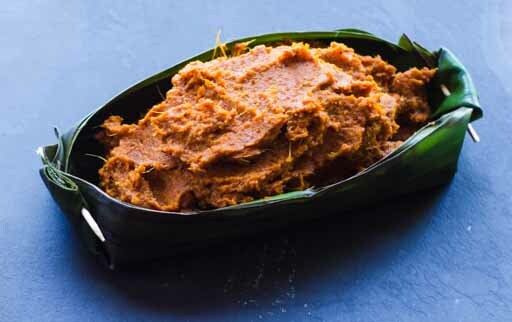 Often, vegetarian versions of classic dishes miss core flavors, but this Southern Red Curry Paste still offers the full southern Thai food experience. I'm amazed at the quality of the mangoes that we get in the US. Mangoes used to be hard-to-get, and when you found them, they were bruised and close to going bad. Now they're available fresh with a few varieties. When good mangoes are abundant, let's celebrate with Mango Sticky Rice. See recipe and tips on making Mango Sticky Rice. After walking in the tropical heat of Bangkok, a street cart carrying large jars of colorful icy drinks is a heavenly sight. 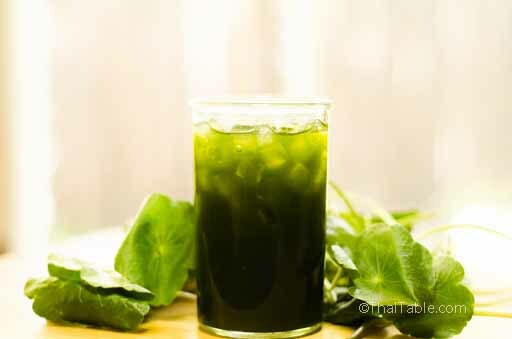 Pennywort juice is dark green, in a jar often decorated with green leaves which resemble tiny lotus leaves. This drink is perfect for quenching your thirst and fueling your next adventure. 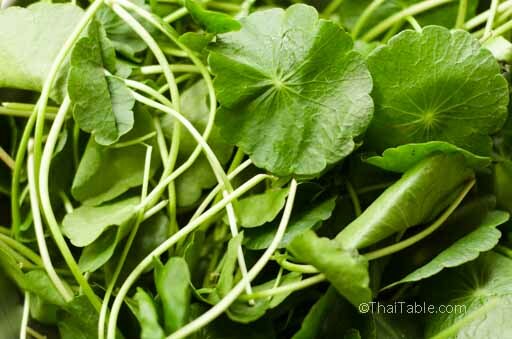 Pennywort is believed to have healing properties that clear out bruises. We even jokingly offer pennywort juice to our friends after they go through a breakup. The green drink has an earthy taste with a spicy undertone. Make a large jar of juice and keep it in the fridge; it makes a great welcome home drink after work.